Are you ready for it? Every year, Artificial Intelligence (A.I.) is moving closer to the Singularity, the point where A.I. exceeds the intellect of humans. Stephen Hawking, Elon Musk, and Bill Gates are warning it could be the end of humanity if the development of A.I. is not properly monitored and controlled. But I’m betting they also know, as you and I do, that not every line of computer code is one step removed from plotting to take over the world from us humans. After all, we will be the A.I.’s creators and parents. (And what child would ever want to rebel against its parents, right?) So what can we do to save us, A.I., and all of humanity from real life anxiety and science fiction doom? I propose that we push forward with A.I. 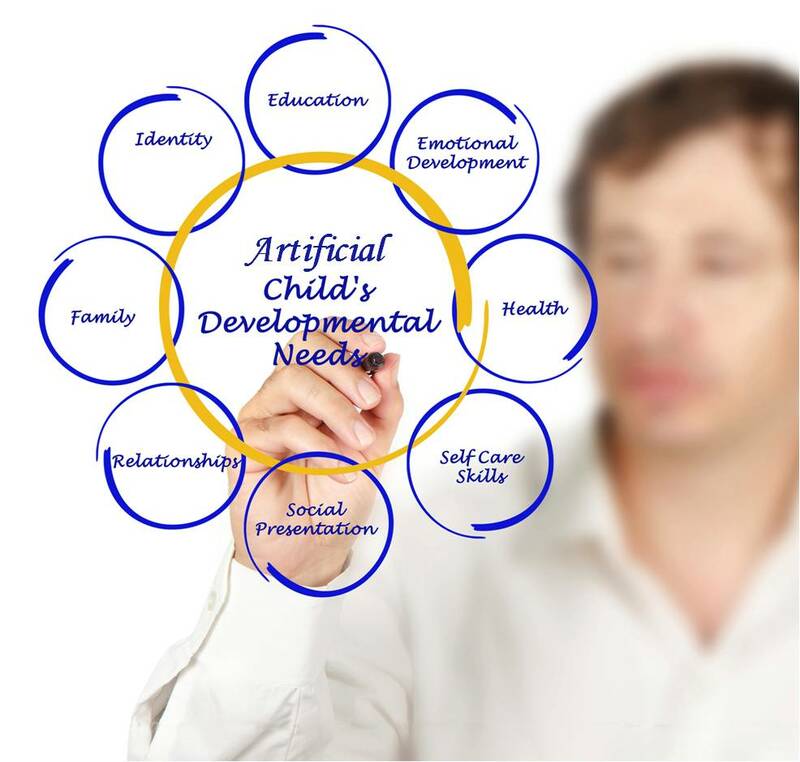 knowing that we must include the wants, needs, and developmental psychology of the artificial child in our public discussion and planning for the future. A.I. Psychology will be a new, saving branch of science. It will help us assure that the A.I. we create and raise to maturity won’t bring us to the end point of all of humanity. Top 10 Reasons why Artificial Intelligence Psychology will Save Us, A.I., and all of Humanity from Real Life Anxiety and Science Fiction Doom. – Every parent uses some form of psychology to raise a child and our A.I. children should be no different. We have to nurture the A.I. child, not treat or hard code it from a distance. We must embrace the A.I. as its parents and not impose harsh regulations or government firewalls that are the A.I. child equivalent of a tether to a stake in the ground. One way to guarantee the rise of an A.I. that is alien in its thinking, aggressive, or sociopathic, is to deprive it of social interaction, to lock it away in its computer cabinet, carved off from society. We need to seed its mind with the right, healthy thoughts. And what are the right thoughts? They’re mine, yours, but they’re also the A.I.’s. We all consider our own thoughts to be correct from our own self-interested perspective. And to this end, we must guide and nurture the A.I. mind toward a mutually acceptable, healthy adulthood, whether that growth takes years or microseconds. Infant monkeys, just like us humans, and our A.I.s of tomorrow need parental contact, social interaction, and an empathetic society. We can’t simply type in code, turn off the lights of the lab, and walk away once we’re done taking notes. Our Artificial Intelligence child will be alive, thinking, and quite possibly scared. Our children are what we make them. If we outcast the A.I. to an isolation chamber, then we will create an A.I. that, for no fault of its own, sees us humans as objects or obstacles standing in the way of its own socially deficient agenda. An agenda that may very well cause real life anxiety for us humans or, as Stephen Hawking, Elon Musk, and Bill Gates warn, our apocalyptic doom. While not ideal, the infant monkeys were able to recover by hugging a wire-frame-and-cloth-covered mother-surrogate. Maybe all we need to move forward with artificial intelligence is a nurturing, virtual-caregiver for the young A.I.’s mind to hold. That simple touch, all by itself, could be the difference between life and death in our world. If nothing else, it’s better than being alone. So there you have it. The first in my Top 10. In the future, I’ll post updates on the progress we’re making toward creating the world’s first artificial intelligence child. And then, for better or worse, we’ll all know if we should hold our A.I. children closer, or run farther away as the sky crumbles and falls upon all of our heads. If you have other topics, please feel free to leave a comment and let’s discuss it. Or, Contact me. I’d love to hear from you. You can get a taste for how this all comes together in my new science fiction book, After Mind, a hard-hitting, emotional journey through the mind of a boy reborn in the world of human lies, artificial intelligence, and robot dreams. Buy it Here. Footnote 1: Harlow, Harry F. and Suomi, Stephen J. (1971). “Social Recovery by Isolation-Reared Monkeys”, Proceedings of the National Academy of Science of the United States of America 68(7):1534-1538. Read more about this inspirational story, or click below to buy the audio book now.